I would have to say that Easter is my all-time favorite holiday. I have such fond childhood memories of getting all dressed up for a full morning at church, followed by a big family dinner and Easter egg hunt. Easter is especially beautiful in my hometown of Fairhope Alabama, and I miss the warm weather and blooming dogwood and azaleas. 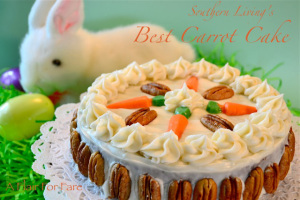 I also love all of the baking that goes along with the holiday and one of my favorite Easter desserts is carrot cake. Whenever I bake a carrot cake I can’t but think of my red-haired, fun-loving, sister, Margie Faye.